The capital A monogram is from Vintage Applique Alphabet from Embroidery Boutique. I added "ava" with the Tinker Toy alphabet from 8 Claws and a Paw. 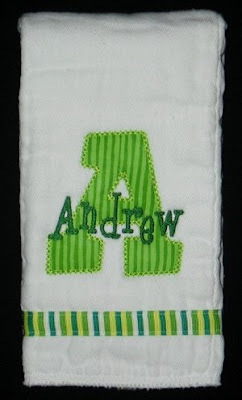 On the burp cloth, the applique A is from Embroidery Boutique's Fun Applique Alphabet. 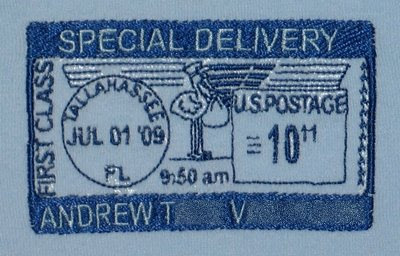 I used the Jason font from 8 Claws and a Paw for "Andrew". Our good friends Gary and Becky are expecting a baby girl any time in the next couple weeks, so I've been stitching fun stuff for her. Both parents are FSU alumni and Seminole fans. 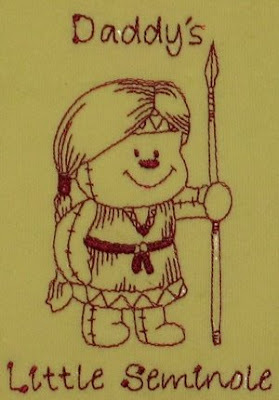 The Indian ragdoll design is from Jumping Needle (no longer available), and I added "Daddy's Little Seminole" with an alphabet I have from Oregon Patch Works. Madison's room is all decked out in pink, so I choose pink for this burp cloth. The lovely monogram is Empire font from Embroidery Arts. 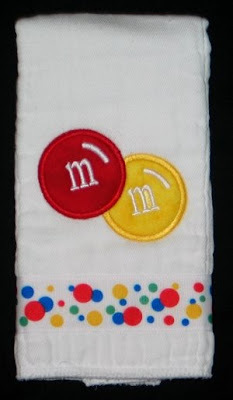 When I found out her name is going to be Madison Marie, I immediately thought of M&Ms. How I do love chocolate... I modified a design from Stitch On Time to do a playful burp cloth with her initials. 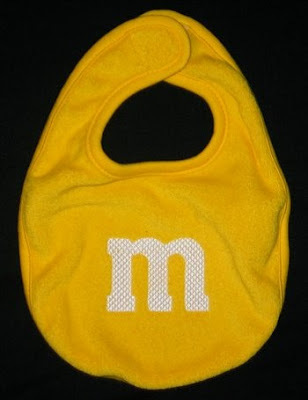 To coordinate, Kathy digitized an "m" for me in a font that would make this bib look like a big M&M. 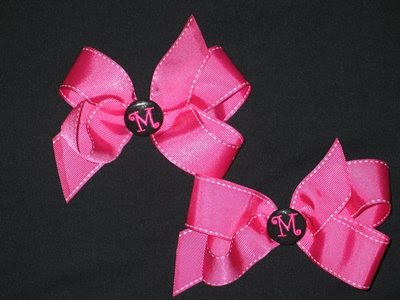 The only specific thing Becky requested were some bows with monogrammed buttons to use on Madison's stroller and infant carrier. 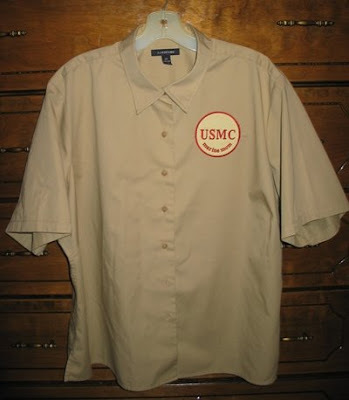 I've had a covered button kit for a long time but never attempted it. There is really nothing to it, and I'm glad I finally had a reason to give it a try! Valerie lent a hand by making the bows for me, and then I added the monogrammed button to the front and safety pin to the back. I hope they work well! 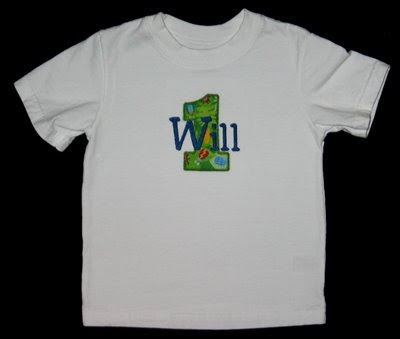 After seeing the other first birthday items I've stitched this year, Rebecca contacted me about making a special shirt for her son to wear today at his first birthday party. 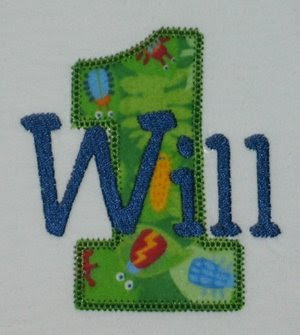 The "1" is from Chubby Wubby Applique Numbers from GG Designs, and the font is Jester from 8 Claws and a Paw. Rebecca picked this bug flannel from my stash. It was a fun challenge trying to get as many bugs visible within the "1" as possible! Amanda requested a couple items for friends expecting a baby girl. She liked a bib I had stitched for a previous order, so I recreated it. 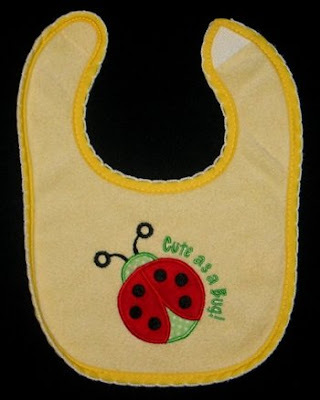 The applique ladybug is from Pegboard Crafts, and I added the text with Embird Alphabet #8. 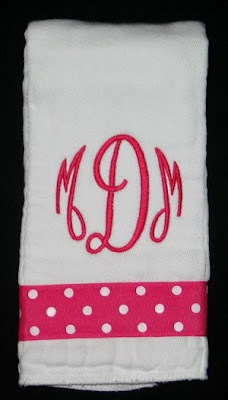 She also selected the baby's monogram on a burp cloth. The lovely monogram is the Empire font from Embroidery Arts. 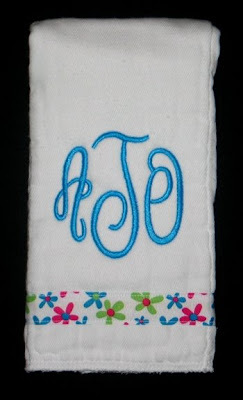 I love these monograms! Our family has some big news to announce -- when Annaliese starts school in the fall, so does her daddy! Carlin Trammel has been accepted at FSU's College of Communication and Information to pursue a Master's degree!! Up until this point, we've been relatively unbiased with sports teams down here in the South, keeping our loyalties to my Alma Mater, the University of Illinois. 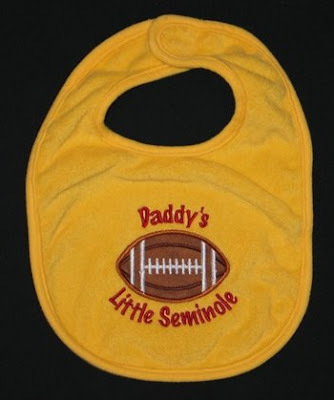 But now that Daddy is going to be a Seminole, it's time for some Seminole gear! 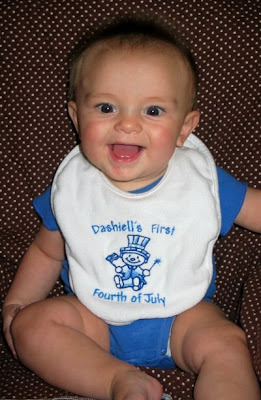 Dashiell is sporting yet another new bib. The applique is from a football sucker holder design from Embroidery Garden (a freebie on her yahoo group) and I added the text with Embird Alphabet #8. 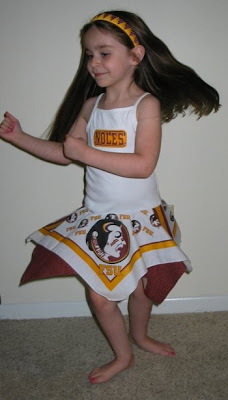 For Annaliese, I finally made an FSU bandana dress for her like Madison's. The top layer of the skirt is an FSU bandana, the bottom is some nice garnet colored calico. 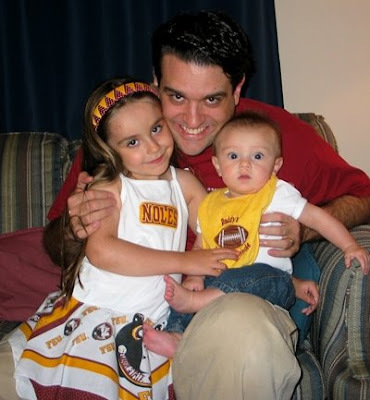 After I cut the center out of the bandana, the word "SEMINOLES" was left behind. One of the rounded rectangle appliques from My Embroidery Haven's yahoo group fits around "NOLES" perfectly, so I appliqued that to the shirt. 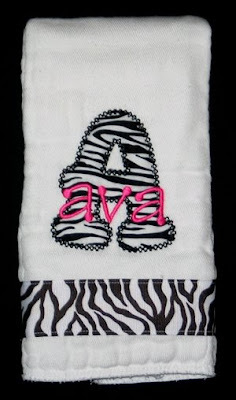 As always, Annaliese already has a matching headband courtesy of Aunt Amy! I made Annaliese's dress at the same time I made one for Kenzie's birthday (Memorial Day weekend). 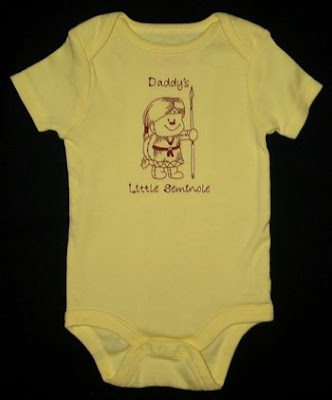 Valerie and I quickly decided Kylie needed one, too. I was out of tank tops though, so by the time Valerie found a blank one, I got the dress made and delivered, we are just now getting a group picture of the girls together! 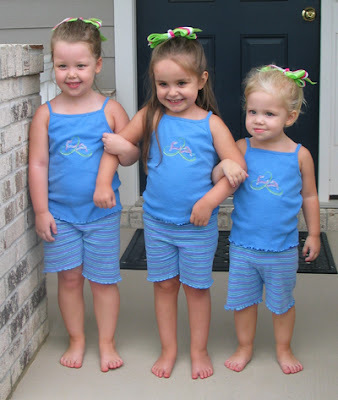 and now their bandana dresses. 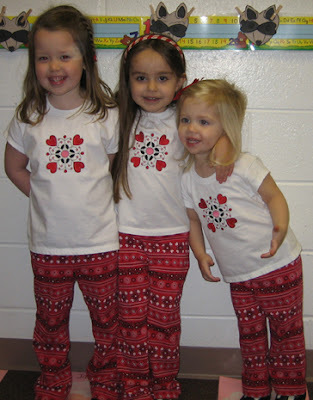 These girls sure are growing up fast! 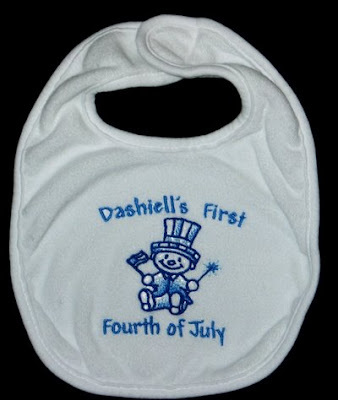 Last week I stitched Dashiell's First Fourth of July bib. I LOVE these designs from Embroidery Library. Kathy digitized the text for me again. I love looking at how much he's changed from his first Valentine's Day, St. Patrick's Day and Easter. Next up, Thanksgiving. Just imagine how big he'll be then! The monogram is Five Star Font's Gift Box Applique Font. I added the rest of the text with Embird Alphabet #8 (I stole the phrase from Kathy who had stitched a burp cloth for Torin in November). 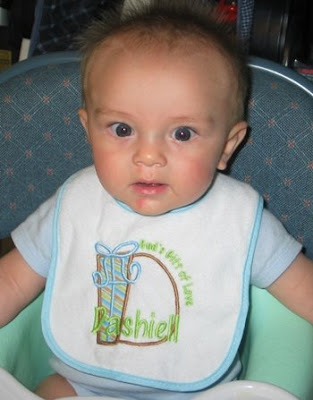 I should have stitched "God's Gift of Noise" -- the first time he wore it he yelled at me between every bite. I guess he was hungry and I wasn't moving fast enough. I'm really behind on my blog posts... waiting for gifts to be received, modeled pics to be taken, etc. 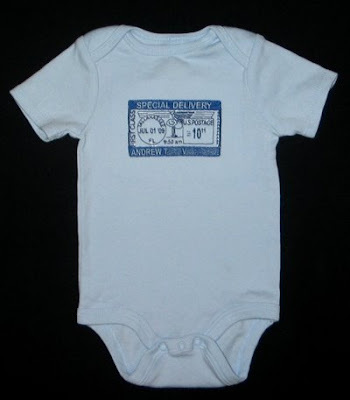 But here's something that I stitched today, delivered today, and now blogged about today! Ginny is a proud mom of a US Marine. She bought a shirt for herself and made an embroidery request. 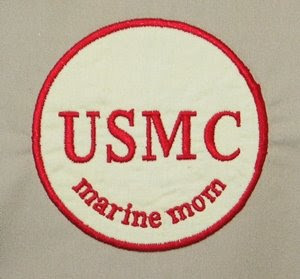 She wanted an applique yellow circle with the text "USMC marine mom" in the circle. 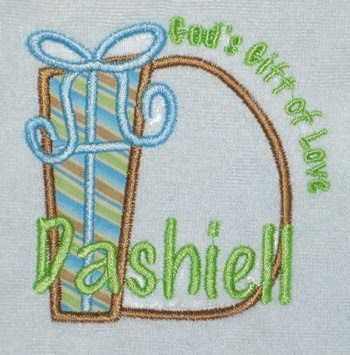 She picked the fabric and thread color, I used Embird Alphabet #16 to match the font she had chosen, and stitched away.